This is a timely and well-written article, offering numerous professionally-prepared examples of how an expert in visual communication can help in preparing and presenting a clear message about a complex set of issues. I have seen excellent examples of these techniques used in court, and I have seen plenty of disasters as well. The disasters I have witnessed have often been prepared and/or presented by in-house staff as a side-project, when they have other high-priority tasks and specialties to handle. This is not to imply that working in-house means unqualified, but to remind all trial teams that we get only one shot at a first impression. If it looks amateurish, the impact (and credibility) may be severely handicapped. Further, this is a very specialized field, and to expect a paralegal to handle all of this in addition to their regular role may be asking quite a bit. Technology is a full-time job during trial. Understanding and explaining are two different things. Frequently, assumptions are made and evidence or argument is presented in such a manner that the fact-finders simply do not “get it.” It is generally very helpful to bring in someone who does not already know all of the fine details or minutiae of the matter, who can objectively offer opinions as to what is understandable, and what is not. This might formally be performed in a mock trial or focus group, and/or might be one of the tasks of a Trial Consultant during the trial. Even though many attorneys have never used technology in court, it is not difficult to incorporate all of its effectiveness when partnering with a firm specializing in this sort of work. I will add that over the years, a great deal of my clients had never before utilized technology in trial, and that the work flow and process remain the same. I will also add that most of these first-timers won their first technology-enabled trial. 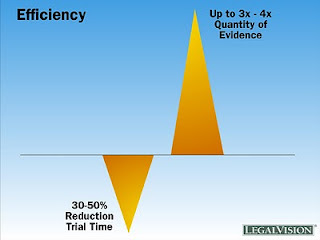 Only the method in which the evidence is published to the jury changes, along with the increased efficiency and control of that evidence – provided an experienced expert is working on the matter. Ms. Pennebaker has pointed out that today’s jury pool is made up of people who have become accustomed to learning via digital media, be it television, Internet or other portable devices. The human mind is capable of understanding and retaining a great deal of information at a very high rate of delivery – thus supporting the multi-stream formats used by many news services. As referenced by Ms. Pennebaker, studies have shown that we learn more and retain that information longer when the message is presented in a mixed-media fashion. That is, when we hear the spoken word and see the pictures, we are then able to store the images and associated facts in our mind. The utilization of various types of media is also key, including blow-up boards, PowerPoint slides, demonstrative graphics and the use of TrialDirector or other trial presentation software. With so many resources for professional demonstrative graphics, trial presentation and technology available, coupled with the fact that jurors do not see this as an “over-the-top” expense in trial, there aren’t any good reasons remaining to hold out. Feel free to consider asking your vendor to meet with you and your client, so they too can be involved in the decision-making process. To offer a client anything less is to offer them less than is readily available to them. Great article! Ah, the old MPEG1 v. MPEG2 debate rears its ugly head once again. Here are some thoughts and opinions on what I would like to see if you provide depo video to me. Not that I'm the only guy out there, and I’m not usually the one ordering the video from you, but I do represent the trial presentation community in that there are certain things that work better than others for us when we go to trial. If I have to rework the files, I will have to tell my client (your client) what I had to do, and why. You might even ask your client if they have a trial tech or consultant who will be taking this to trial to make sure you get it right for them. The attorney does not always understand what they really need. “DVD” can mean a number of things to anyone. (hint: If they do not have someone, this might be your opportunity for some extra money on a referral to your favorite trial firm). We covered some of this last weekend in the NCRA CLVS Trial Presentation Tech certificate program. 1. Deposition quality - May be significantly lower than other types of video, such as Day-in-the-life, site inspections, etc. Like it or not, it’s only a talking head, and if it is high quality MPEG1, especially when shot on digital and encoded with hardware such as Digital Rapids or Optibase, it will look just fine. On the other hand, if you are shooting directly to DVD, you will end up with a good MPEG2, which is also fine. Nobody has ever asked me in trial, “Who shot that nice depo video?” 352x240 works just fine. Be careful with software transcoders – sometimes they will work OK, sometimes not. 2. File length – In my experience, the 2-hour “standard” seems to work just fine. I have not seen anything longer that worked. Not that it couldn’t work if it were set up properly, but I’ve had issues with it. I would much prefer you give me the original 4 files than attempting to join them together for me. You’re not doing me any favors with that. 3. File size – I would prefer if you able to keep each 2-hour file at or around 1GB. Yes, you can provide a single 2-hour file at over 4GB on one disc, but if it’s a large case, I won’t want all of that extra weight on my drives, nor the increased access time when I want to play a video clip. I will be forced to reduce file size. 4. My favorite – The best format you can hand to me that I can easily use without issues is multiple MPEG1 on a single DVD. If an entire depo is on there, life is quick and easy for me. Again, MPEG2 is OK, but please be mindful of file size. VOB files will have to be converted to straight MPEG2 or MPEG1 for trial. 5. File naming and sync – If you will do the sync, you will have to name the files. If you name the files in some fashion that makes no sense or becomes duplicative in the trial database, I will be forced to rename the files and then re-associate them with the transcript. I have seen some strange naming conventions, including ridiculously long and descriptive names, short duplicative names, etc. If you do not sync, I can easily rename the files when I do the sync. Anything I am forced to do which takes excessive and unnecessary time to correct will be reported to my client. 6. Non-depo video – Shoot as clean as you wish. If you’re shooting a site, Day-in-the-life, etc., quality is then very important. MPEG2 is the desired format. We don’t want to have to locate and load any new “cool” codecs to play video in court. 7. Shooting depos with documents – I would recommend trying to discourage this practice. With trial presentation software, it simply doesn’t make sense to shoot video of a document the deponent looks at. It is blurry and difficult to read. If you absolutely must shoot something that will have to be displayed, then you will have to jack up the quality for that, but it would be much better to let counsel know that the best practice is to keep them separate until trial. Take all of this for what its worth. Not everyone has the same opinions, but I have simply shared some info that may or may not be helpful to you. Remember that you’re not shooting Hollywood video at the depo, and that someone like me may have to work with your product, should it go to trial. This will be posted on the LegalVideoForum Yahoo Group, Trial Technology LinkedIn Group, and also on the Court and Trial Technology Blog. I was invited to write and present some of the course materials at the 2nd Trial Presentation Symposium (Certificate Program) in Miami this past weekend by the NCRA's CLVS Section. Although there may be some room for improvement and refinement, overall, the program, in my opinion, was a very well-presented weekend, focusing on many of the basics of trial presentation. We also touched on a few advanced topics, and there are already plans in the works for an advanced Certified Trial Technician course. This may take awhile, but they are leading us in the right direction. We also enjoyed presentations by TrialDirector and Visionary, each showcasing their latest and greatest versions. Attendance was at capacity for the room, which had to be changed due to the demand. This is a clear indication that there is a need for this type of program. Attendees even included a few experienced Trial Technicians whom I've known for years. With so many winging it and coming up with so many different methods of doing things, it is a great thing that we are finally working together to come up with some best practices and standards, and eventually a certification that can help ensure a client that their trial tech is not simply a trainee with 2 or 3 trials under their belt, after having closed the deal by sending in a slick salesperson to get the case in the door. This is a common practice in this profession, and it is not a good thing for the advancement of using technology in trial. When the client's experience is bad, it reflects upon all of us. There is far more to this than simply being capable of operating a trial presentation software application. The next program is already on the calendar, planned for September 10, 2010 in Scottsdale, AZ. I plan on attending and presenting again. I did not get paid to do this. I am doing it in an effort to help bring increased exposure and credibility to our profession. It is good for all of us. Finally, Robb Helt (fellow guest presenter) and I were asked to take the exam. Trust me, my fingers are crossed. I REALLY don't want to fail this exam!